Thunderbird was kind enough to send me a sampling of their real food bars. What I like most about these bars is just that…they are made with REAL FOOD. When deciding which bar to try first, being a lover of carrot cake, I immediately zeroed in on the CASHEW + FIG + CARROT flavor. NUTRITIONAL FACTS: Serv. Size 1.7oz (48g), Calories 150, Fat Cal. 26, Total Fat 3g (4% DV), Sat. Fat 0.5g (3% DV), Trans Fat 0g, Cholesterol 0mg, Sodium 204mg (8% DV), Total Carb. 29g (10% DV), Fiber 3g (11% DV), Sugars 26g, Protein 4g. 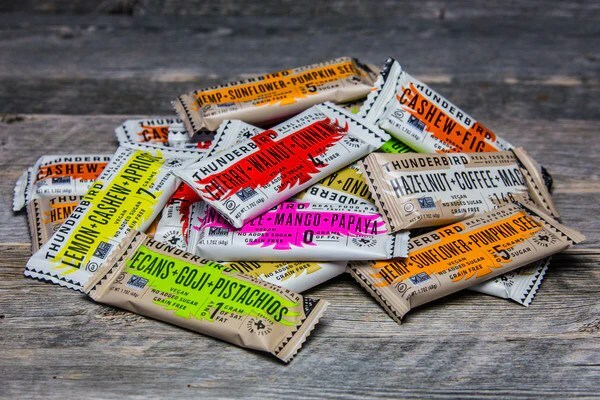 I am really impressed with the taste and texture of the bars and highly recommend them to my endurance athletes for fuel on their runs, bikes, etc. because they have a fair amount of bars that are lowfat and high carb. Thunderbird also makes some bars that are higher fat which would be great for my clients who have trouble getting all of their fat macros in (I never seem to have trouble with that!). The HEMP + SUNFLOWER + PUMPKIN SEED bar has 22g fat and lower carbs at only 11g. INGREDIENTS: Dates, Macadamia Nuts, Almonds, Pumpkin Seeds, Sunflower Seeds, Hemp Seeds, Macadamia Nut Butter, Coconut Shreds, Extra Virgin Coconut Oil, Cinnamon, Himalayan Sea Salt. NUTRITIONAL FACTS: Serv. Size 1.7oz (48g), Calories 250, Fat Cal. 198, Total Fat 22g (33% DV), Sat. Fat 6g (30% DV), Trans Fat 0g, Cholesterol 0mg, Sodium 75mg (3% DV), Total Carb. 11g (4% DV), Fiber 3g (4% DV), Sugars 5g, Protein 7g. HERE is a link to all of their bars. If you are unsure which flavor to get, Thunderbird has 3 different types of assorted boxes for you to purchase. Make sure you enter FITQUEST at checkout for 20% off your order. Please know that I have ZERO affiliation with the company and do not make any money by recommending them…I simply like their products and they generously offered a coupon code for my readers. My husband and I have been together for 20 years and married for almost 17 (times flies). In that time I have learned a ton about cooking from my in-laws. Leave it to the Chinese to figure out a way to make each and every ingredient taste the very best it possible can. Their tricks/methods are usually really simple, but man do they yield great results. This morning one of my clients emailed me to ask me how I prepare shrimp and though I have been using this method for years, it never dawned on me to write a post about it until today. I don’t know if you have ever realized that texture makes a huge difference in the taste of shrimp. In my opinion there is nothing worse than soggy shrimp; it needs to be crisp and crunchy. To achieve that crunch, peel and devein the shrimp. Place the shrimp in a colander along with 1/2-1 tsp of sea salt or kosher salt. Mix the shrimp and salt together with your hands and leave it in the colander to drain over a plate for 10-15 minutes (this is where the magic happens). After 10-15 minutes some of the liquid from the shrimp will have gathered on the plate. Rinse the shrimp really well under cold water to remove the salt. After thoroughly rinsing the shrimp, lay down 2 layers of paper towel and beginning on one side place the shrimp on the towel in rows touching each other. Once all of the shrimp are on the paper towel, cover with another layer of paper towel and roll it up (like you would roll-up a log of cinnamon rolls before cutting them). This will remove any remaining moisture. If you are not ready to cook the shrimp, place the roll in the refrigerator until it is time. I usually saute a bunch of shrimp in my wok on high heat with a little oil and then add some of it to a stir-fry for dinner, but I have also made them into shish-kebabs and grilled them. I keep the remaining shrimp in the fridge to use in meals for the next few days; burrito bowls, tacos, etc. You can cook the shrimp using any method you prefer and I guarantee you will notice a difference because of the time you took to salt, drain, and dry them.